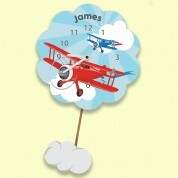 Children will love to see their name printed on this colourful clock in their nursery or bedroom. It features a silent tick mechanism and is made complete with a swinging pendulum. 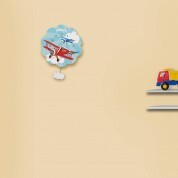 High up in the sky, two planes soar through the clouds to find new adventures! A colourful banner flies through the wind behind each of them, as they reach further through the clouds. A fluffy cloud swings on the silent pendulum, soothing a baby or child to sleep. The bright colours will stand out in any room and it will spark any child's imagination whenever they look at it. The child's name is included in an arch in the sky. There is even room for two names if the children share a room. As they get older, the clock will make learning the time fun! It is designed and made in the UK and features a quality German Quartz movement which compliments the quality of the British design and manufacture. We think our silent wall clock would suit any occasion from a first birthday to a Christening, Dedication or Baptism. They will love to see it in there room as they grow older. Other designs are available.